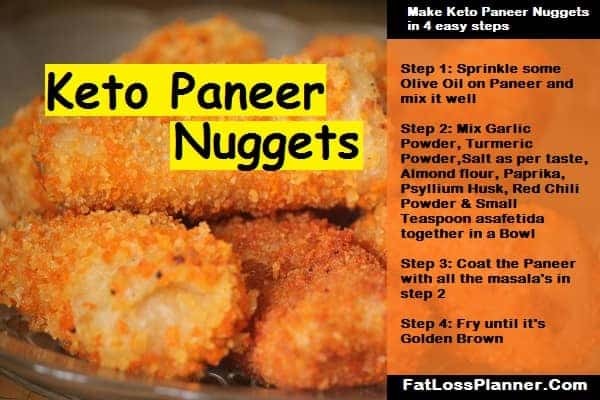 Earlier I had showed exactly how you can make keto chicken nuggets and I got lots of positive response and lots of readers requested for Keto Paneer nuggets recipe. I and my wife decided to give it a try and guess what we managed to nail it. Keto paneer nuggets that we made was tasty and amazing, we even offered this keto nuggets to our friends and got positive response. So after trying and testing I am putting a super tasty recipe that will not only keep your taste buds happy but also help you to lose weight by getting into ketosis. To make Keto Paneer Nuggets you would need below ingredients. Once you have the above ingredients ready start making your paneer nuggets. Follow these 5 simple steps. Step 1: Sprinkle some Olive oil on Paneer (Make sure the oil stick nicely to the Paneer). Step 2: Take a bowl and mix all the above ingredients. Step 3: Coat the Paneer with the masala. Step 4: Heat the pan, put some cooking Olive Oil in it and fry it until its golden brown. You keto style Paneer nuggets to ready to be consumed. Make sure you don’t take it with tomato sauce as it will ruin the ketosis process. 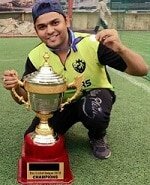 Instead it more wise to take it with green chutney. If you want to lose weight through a concrete Keto diet then I would recommend you to see my 1 month Keto diet plan here. It consists of Indian foods and diet chart that helps you to ignite ketosis and lose weight within a month.